I have spent a great deal of time thinking about colours for this bike. I considered a polished metal tank for a while. An early idea was white with black detailing on the tank mirroring a black with white pinstripe seat. The old Honda race colours of red, silver and yellow have been a strong possibilty and will no doubt appear on a later project. 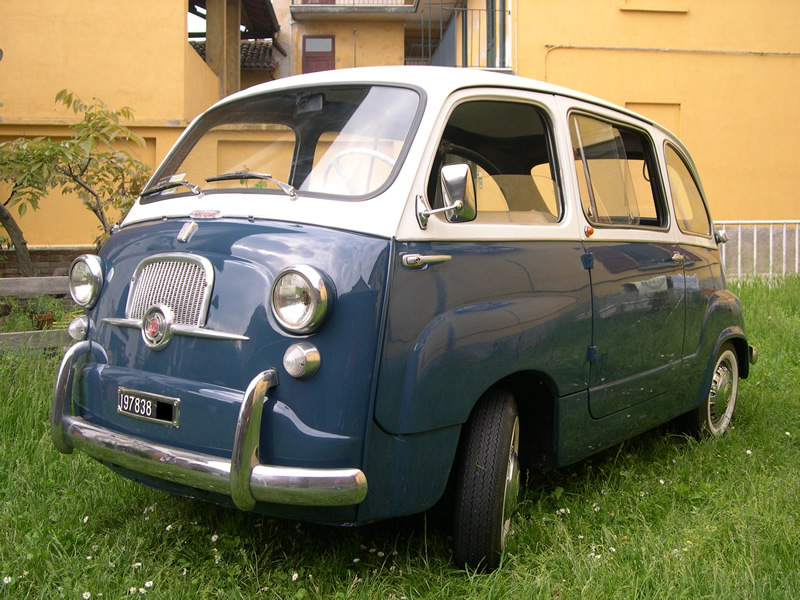 But late last year I spotted a vintage Fiat 500 in a particular shade of blue with dark tan leather seats. It was a combination that worked perfectly together and I immediately had a picture of the finished CB in my mind. Now I could show you a picture of that particular combination but I think that might ruin the final unvailing of the bike. So for now, here is a little beauty I came across while searching for a Fiat paint code. It’s not a bike but it’s certainly cool. In a weird way. “I was a very clever child, Pete. I used to read a whole book each day” said Tim, the previous owner of this bike. Well, he obviously didn’t read any books about painting motorcycles. The key points to remember about painting are preparation, preparation and preparation. For most people this would mean starting with a thorough clean, before moving on to media blasting or various grades of sanding. Once the surfaces had been prepared you would probably finish with careful masking of the parts you don’t want to paint. Or, as in this case, you might look at it for a while and decide to just empty 3 cans of Hammerite on to it and hope no one notices the thick layer of grease beneath! My original plan was to have the engine media blasted before painting. That certainly would have been the easiest solution, but I really want to know every inch of this bike. Beauty is in the detail and the cb175 was never much of a looker, so it’s important to me to study all the components and really get a feel for how they can be improved. Bottles of chemicals and degreasers, wire brushes of various shapes and sizes, 4 grades of wet and dry paper, wire wool, paint scrapers and even toothpicks have been doing battle with the silver abomination and I’m nearly ready for paint. Nearly! 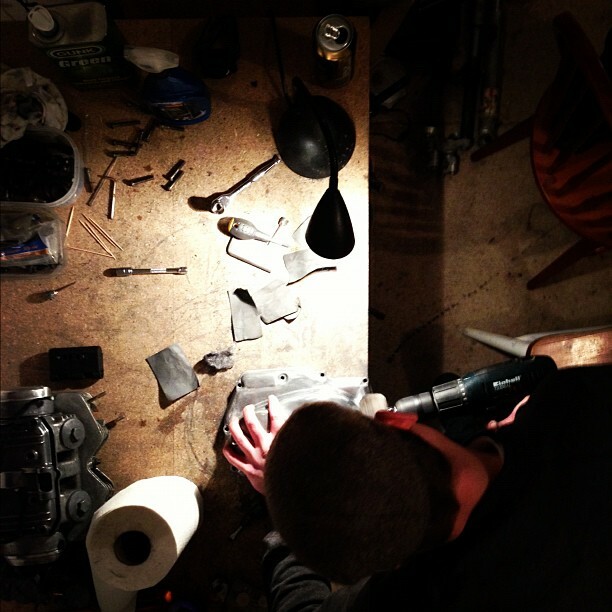 These are the ramblings of a retro-custom-classic-street-scrambler-type-of-thing motorcycle builder. The current victim of my creative tinkerings is a 1970 Honda cb175 which is gradually being transformed from a few boxes of rusty, greasy and largely Hammerite encrusted parts into something much more beautiful. I hope. My initiation into the mysterious world of mechanics took place in a garage, unsurprisingly. The garage was called Grove Motor Works and it belonged to my Grandfather. For me, aged 4 or 5, it was a greasy oasis in a corner of early 80′s Belfast where I was fascinated by the noises and smells and even got to do the odd oil change on the Land Rovers that were my Granda’s speciality. Although I’ve had a few career changes over the years, one thing has always stuck with me; I’m a grease monkey and I always will be.